Our students invest a lot of time and effort into their Capstone projects, and we love when that dedication can benefit Georgia’s organizations and communities. This past Spring, one of our teams was tasked with creating a native iOS app to highlight Norcross, Georgia as a prominent location for the film industry. 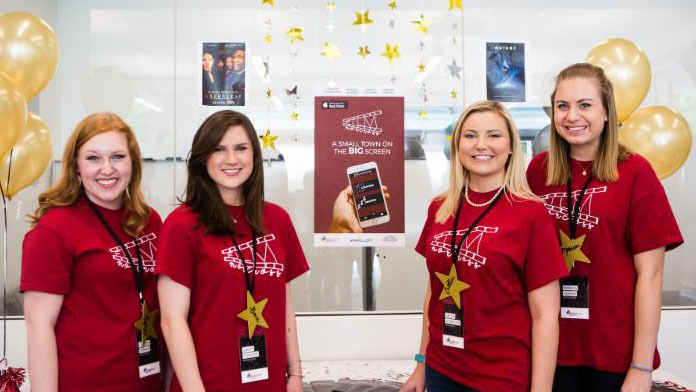 Caitlyn Glasscock, Monica Korfas, Grace Lovvorn, and Chelsey Shirley joined forces and hit the ground running to design the mobile app, Film Norcross. Working closely with the Norcross Director of Economic Development and a team of city officials and corporate supporters, the four women decided on the design, defined the mission, and laid out a game plan for the app’s development. Within four short months, the team was able to create a stellar application that provided detailed information about each of the movies and TV shows previously filmed in Norcross. In addition, Film Norcross users could use the app’s map-based feature to locate and navigate to the various filming locations throughout the city. By the end of the semester, the app was near completion, and with a few modifications, it would be ready to submit to the App Store. Cue Veronica McManus. Deciding to take on Film Norcross as a special project, Veronica picked up where the previous team left off, making the polishing touches to get the app ready to go public. With the combined effort of these awesome students, we’re happy to announce that Film Norcross is now live in the Apple App Store! Download now to learn more about the film industry in Norcoss and to get a taste of the great work our students are doing in the NMI!